No great institution can exist in the absence of great leadership. P-TECH 9-14 schools are no exception. Research shows that “most school variables, considered separately, have at most small effects on learning. The real payoff comes when individual variables combine to reach critical mass. Creating the conditions under which that can occur is the job of the principal.” (Wallace Foundation, 2011, p. 2) In the P-TECH 9-14 model, the job of the principal is all the more challenging because the individual variables expand beyond the confines of the school to include the College and Employer Partners. In developing the first P-TECH 9-14 school, the New York City Department of Education, The City University of New York, and IBM knew that this educational reform effort depended in large part on identifying a visionary and passionate leader. This leader needed to be able to shepherd this new model from idea to school and to quickly demonstrate significant success. New York City certainly had abundant talent to choose from, but finding the right leader for this challenging role because a critical first step for the partnership. To inform its efforts, the partners wanted to hear from school leaders about both best practices and pitfalls when starting a new school or improving any school. They collaborated with the New York City school principals’ union to host a reception for 25 school leaders at IBM’s offices in Manhattan during the early phases of planning. At that reception, school leaders learned more about the school program and offered their advice. One person in the audience that evening was Rashid Ferrod Davis, who would eventually be chosen — after a rigorous selection process — to serve as P-TECH’s founding principal. Mr. Davis, who had more than 10 years of experience in New York City Public Schools, brought impressive experience with him. Most recently, he had served as Principal of the Bronx Engineering and Technology Academy (BETA) and was widely recognized as a turnaround leader. BETA was listed on U.S. News and World Report 2010 America’s Best High Schools, with a Silver Medal recognition, and on Newsweek’s Top American High Schools list for 2010 and 2011. 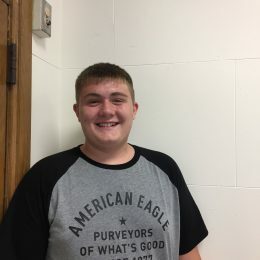 By the time they reach the age of 25, only 30 percent of people in this country have completed a four-year college degree. The numbers are much lower for people of color. 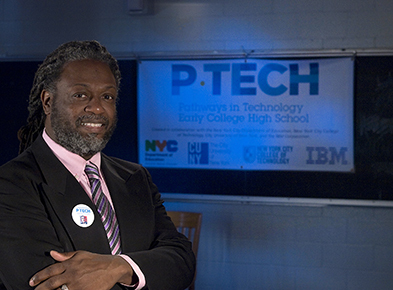 Rashid Davis is the founding principal of P-TECH Brooklyn. its doors to students in 2011. P-TECH is about promise, but it’s also about expectation. For more information about Shared Decision-Making in the P-TECH 9-14 model, please visit Shared Decision-Making.